Cat has just murdered her former best friend Nicolette and she can’t believe that no one has caught on yet. As Cat hurriedly writes a confession detailing the events leading up to her fight with Nic, she looks at all the lies and secrets kept in her hometown. Guernsey is a small island that was changed forever during the German occupation, and Cat’s father became a local expert concerning Guernsey’s history. Cat believes that her family history has determined what kind of person she has become. Her own story is intertwined with her Uncle Charlie, who was thirteen when the Germans first came to Guernsey. Charlie was eventually sent to prison and then a concentration camp when he was only fifteen. As Cat reflects on her relationship with Nic, it feels like everyone in Guernsey is also telling lies. This is the only time that I’ve been able to write a review where I reveal not only that there was a murder, but I can say who died and who killed them. The fact that Cat killed her friend Nic is revealed in the opening paragraph. The book takes place in 1984, while transcripts from Cat’s father flashback to the 1940’s. Cat’s uncle, Charlie, left her father with audiotapes detailing his involvement in the German occupation. Footnotes are featured throughout the entire novel, written by either Cat or her father. I found the footnotes to be useful but some of the transitions into the past felt awkward. At first I preferred Cat’s narrative to Charlie’s, since Cat’s read more smoothly. In the end, I actually preferred Charlie’s story. While it didn’t flow as well (and perhaps that was the point,) Charlie’s story ended up being gripping and well thought out. I was shocked by the ending of that storyline, and I thought that it was a perfect ending considering the themes of the novel. One could argue that none of the characters were likable, but this is the type of book where that is actually the point. However, I actually found myself liking the characters despite some of their actions. I loved Cat’s sense of humour and her honesty, although I hated some of the things she did. This book was primarily character driven, but the plot was interesting and creative. It was a bit slow moving at times, but it was worth it in the end. The historical aspecta of the book were well thought out, although some of the facts were included awkwardly. The Book of Lies takes an intriguing concept while focusing on an aspect of history that it often overlooked or misinterpreted. As a history student, I think that this book expresses a lot of interesting ideas about the relationship between the past and the present. 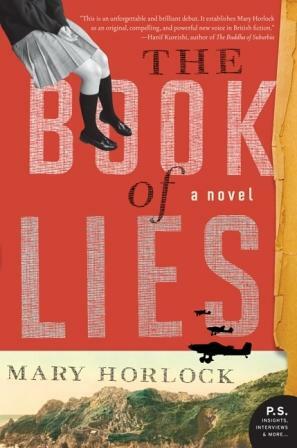 The Book of Lies is the type of book that you can’t really compare to anything else. Original and engrossing, it’s not a book I will soon forget.